When duty decrees former rogue Alexander Hawksworth fill the vacant vicarship a male in his family has held for generations, he resigns himself to a sober existence. Though he’s committed to his parish, he misses the soirées and parties, especially after the precocious Brette Culpepper arrives in London. After he unexpectedly inherits an earldom, he’s determined to make her his countess - until he’s accused of murdering the previous earl. New to society, Brette adores the whirlwind social scene and the slightly sensual verbal sparring with the devilishly attractive Alex Hawksworth. She finds herself falling in love with the charming vicar, but when rumors circulate that she’s a peer’s illegitimate granddaughter, her world turns upside down. To make matters worse, a newly appointed guardian emerges, intent on forcing her to wed an elderly degenerate instead of Alex. *Previously published as Brette: Intentions Gone Astray. I absolutely loved this story! Brette is feisty and such a sweet soul but sometimes the best of intentions go awry. Alex as a rector is good but it doesn't fit him well then he is thrust into the role of Earl. They both were wonderful and I loved their story. There were a few twists that I didn't expect. Overall I really enjoyed this book and would definitely recommend it! Brette and Alexander are two kind people. They love each other but both think they are not good enough for each other. Some unexpected circumstances happen which mire the waters even more. Though fate has other ideas and their love will prevail. I received a complimentary audio and this review is voluntary. You won't want to stop listening! This is the first Collette Cameron book I've read, and I thoroughly enjoyed it. I liked it because the heroine wasn't a total ditz and she wasn't a mean girl. She was just normal. I'm getting REALLY tired of authors trying to portray strong women, but all they accomplish is writing women that no one would want to be friends with, let alone build a life with. They are just so mean! And since when is selfish a synonym for strong? Anyway...this book is not like that. Brette is relatable. A couple of disclaimers up front: a) It is the 3rd book of a continuing series. Though it works as a stand-a-lone, it would have been much better if I'd previously read the first 2 books in the series. Also b) I received this book in audio format in exchange for a fair and honest review. This book has 2 concurrent plots. The first is the sudden, unexpected and life changing news that Brette has received an inheritance from her natural father. So not only is she an heiress, but she is illegitimate! So her sisters are her cousins, and suddenly she is a social pariah. Her world is totally turned upside down. Brette goes on a voyage of discovery, forging new family ties and in the process making a new identify for herself. The second running plot revolves around Alex Hawksworth the vicar, who is in love with Brette. He's never had enough money to be able to support a wife, so Brette is beyond his touch. This plot point seemed VERY weak to me. In every Regency book and movie I've ever read or seen, vicars are gentry, they receive a home provided by the parish and depending on their connections, can obtain more lucrative "livings". I find it hard to believe that Alex, with his connections, cannot obtain a lucrative enough living to support a wife. I suppose it depends on the picture he has in his head on the type of home he wants to provide and whether or not that's realistic. Now, Alex suddenly finds himself inheriting the Earldom of Wickham due to the previous Earl dying in a house fire. There's only one problem...Alex is the #1 suspect in the murder!! So, there are mysteries to solve: Were Brette's parent's married? Who killed the previous Lord Wickham? Who's trying to kidnap Brette? Will Alex be able to convince Brette that he loves her and she'd make a great countess? This complicated plot could have become very disjointed, especially for a first time reader. But Collette Cameron's delicate touch kept me captivated, wanting to continuously know what happened next. I'm definitely going to go back and read the first 2 books of this series! If you could sum up Brette: Intentions Gone Astray in three words, what would they be? What other book might you compare Brette: Intentions Gone Astray to and why? I would compare the character of Brette to Jane Austen's Emma. This audiobook was delightful! 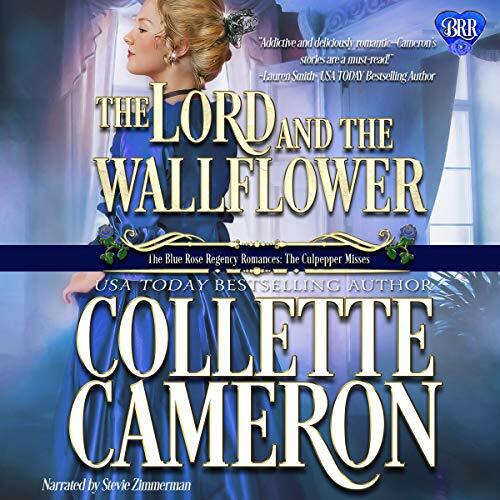 The story is lovely, as is Collette Cameron's main character, BRETTE. She reminds me a bit of Jane Austen's Emma, and not just in her desire to be a matchmaker, but in her charm, confidence, and general way she maintains control of her own life and choices. She does what she believes is the right thing for those she loves. Alexander "Hawk" Hawksworth was also easy to admire. He claims roguish ways that he feels make him ill-suited to be a rector, but is in fact kind, humble, and quietly seeing to the needs of the class fortunate. Oh, and quite in love with the incomparable Miss Brette Culpepper, no matter her station. If only she would believe his feelings were true. ~Complimentary audiobook received from a giveaway. All opinions expressed in this review are my own. Would you listen to Brette: Intentions Gone Astray again? Why? Yes I would listen to Brette again. I had already read the book and I found I had forgotten some elements of the story. I loved the characters of Brette and Alex, there was were also some less savoury characters but then that only adds to the story. What was one of the most memorable moments of Brette: Intentions Gone Astray? I loved the way Mr. Shipwreck ( wonderful name) stood up to the duke. He was fearless and succinct in his argument. Have you listened to any of Stevie Zimmerman’s other performances before? How does this one compare? Yes, I have and it was just as good. Stevie uses a variety of voices and accents for the characters and this really adds life to the storyline. Oh yes, Alex's declaration at the end. Very moving and endearing. This was another excellent read in the Series, I've read them all so far and I'm looking forward to reading about more of the family. I also enjoyed the way the family was included in the storyline. There were a few unexpected twists and turns in the story as well. As with Collette 's books, there are some unique and amusing turns of phrase. I receive a free copy which I have voluntarily reviewed. This is my honest review. The unexpected change in the hero and heroines circumstances. Brette thinks she knows who she is but an unexpected letter changes everything. Alex thinks he knows what his future holds until a fire changes his position. Two friends find that their lives are now changed forever, can they find love together as well? It was a question I wanted to know from the first words read by Stevie Zimmerman and Collette Cameron's story did not disappoint at any point along the way to the end. Brette Culpepper is petite, beautiful, and kind hearted. She enjoys the whirlwind of society and loves matchmaking. The problem is she is not very good at the matchmaking part. Alex Hawksworth, who was once a rake and is now a rector, is absolutely head over heels in love with Brette. And now, to each his own conundrum. As she prepares for what she is sure to be exile in the country due to her latest matchmaking attempt gone astray, Brette receives news that her father has just died and left her an inheritance. This is quite a surprise, since she and her sisters thought their father was already dead. It turns out that she may very well be the illegitimate daughter of her aunt and an actor who was also the second son of a duke (who was more famous for his smelly feet than anything her ever did). At the same time, Alex discovers that his cousin, the earl, and his son have been killed in a fire and he is now Earl of Wycombe. That’s wonderful, or would be if he wasn’t accused of causing the death of the old earl and his son. Our hero and heroine need to find the truth of their situations. As they work to solve these problems, they fall even more deeply in love. Just as they are working through the last of their doubts about marriage, more news arrives. This time it’s a good news, bad news scenario that creates one last conundrum. This one, happily, is easy to solve. Brette is another delightful story by Collette Cameron. The characters are realistic and loveable, at least most of them. Within the story are splashes of humor, mystery, and surprise. I enjoy Stevie Zimmerman’s narration. Her rendition of this book was quite entertaining. I especially like her portrayal of Brette. She makes her sound like the cute little imp she is supposed to be. Brett different from her sister and cousins. why? This was an excellent narration. Since this is a regency romance it's fitting that the narration is British. Don't know is the narrator is Brirtish or if she just pulls it off well. Lots of male and female characters and she does an excellent job. The story itself is both funny and even at times a little dangerous. Brett is rather headstrong but when she receives word of her father's death it literally turns her world on its ear. You'll love the chemistry between Brette and Alex. Great story! Alexander is determined to make Brette his Countess. Brette's guardian is also determined to marry her to an elderly man. Between sisters, cousins and a dog the story hits new levels. What a whirlwind! Loved it!